This DVD pair provides a very effective coverage of the changing face of German armour through WWII and the part that Guderian played in the effective deployment of armour in fast mobile war. The 100 minutes of original rare and unseen archive film will be appreciated by enthusiasts, but the bonus films and picture galleries make this a DVD not to be missed. DESCRIPTION: The first DVDs in this series based on original rare and unseen wartime film were adequately presented but had an economy of presentation. As the series has unfolded, more attention has been paid to jacket art and general media presentation which may not add anything to the excellent video content, but indicates success of the series and will help to increase sales. In this DVD, there are two disks with three bonus films and nine picture galleries. As with the other DVDs in the series, the sound track is original and the English translation lacks the mobility and impact of the footage and stills pictures. Anyone who has come fresh to the subject may have a little difficulty in identifying particular models of tanks and understanding the different types of armoured fighting vehicle. Germany entered WWII with some very effective Czech tanks that offered some advanced features, but as this footage was shot and used as Nazi propaganda, the debt owed to Czech design and innovation is not highlighted. The basic German designs were the Panzer Type I and Type II tanks that were reconnaissance vehicles, lightly armed and armoured but with good mobility, suffering from low reliability. The Type III and Type IV panzers were significantly better designs, entering service in the early stages of WWII and remaining in service through the war. After initial introduction as well-armed and armoured cruiser tanks, these two types were modified with better guns and additional armour and some were built or rebuilt as assault and anti-armour tanks where the main gun was mantel mounted in the hull rather than in a turret, limiting traverse and elevation/depression but allowing a more powerful gun to be mounted. 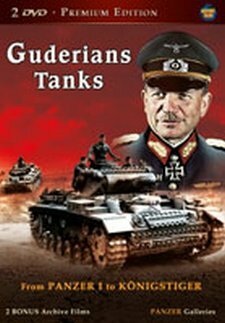 Guderian was responsible for developing the tactics of lightning war, although he was influenced by the writings of a junior British army officer and a still obscure French tanker de Gaulle. Spurred on by the unwelcome surprise of the new advanced Russian tanks, the Germans developed the Panther and Tiger tanks. The problem that German tank production failed to overcome was general reliability. As with the Bf 109 fighter, German production tried to enhance existing designs and this provided a better level of reliability because many early problems were removed as the successful design was further developed, but at the price of lower performance that some completely new designs. As the war became increasingly desperate, many new designs were rushed into service and this led to many models being built in low numbers. When the Panther and Tiger tanks were working well they were formidable machines with powerful guns, low ground pressure, good mobility and very effective sloped armour. The Elephant may have been a ponderous and unreliable design built in small numbers, but the King Tiger was a powerful main battle tank. If there was a general weakness in later German designs, it was in over-complication, contrasting with the American approach of producing a small number of designs in considerable quantity. This DVD pair provides a very effective coverage of the changing face of German armour through WWII and the part that Guderian played in the effective deployment of armour in fast mobile war. The 100 minutes of original rare and unseen archive film will be appreciated by enthusiasts, but the bonus films and picture galleries make this a DVD not to be missed.